(MP192). Commander Eric Tufnell RN (1888-1979). .
Standard size: 15 x 10 ½ ins (38 x 26.5 cms) approx. 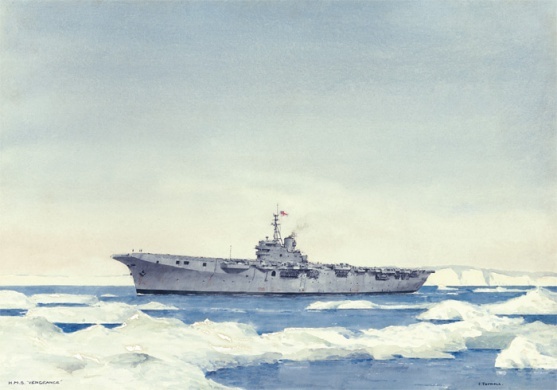 Although Tufnell seldom dated his paintings (and this one is no exception) we can be pretty sure that the year is 1949 and HMS VENGEANCE (Captain J Terry MVO RN) is in the Arctic Circle carrying out cold weather trials. The carrier had sailed from UK on 5th February 1949 and crossed over the Circle 4 days later: Operation RUSTY was conducted for the next 4 weeks together with, at various times, HM Ships GABBARD, St KITTS, LOCH ARKAIG, ARTFUL and RFA WAVE PRESIDENT. On 15th February VENGEANCE was holed up forrard when she hit an especially solid piece of ice and although Damage Control parties did a good job in the bitter conditions the temporary repair was not entirely successful and to an extent dogged the remainder of the trial. VENGEANCE returned to Rosyth on 9th March and was dry docked for permanent repairs to her damaged bows shortly afterwards. In November 1952 VENGEANCE was transferred to the Royal Australian Navy and remained HMAS VENGEANCE until August 1955 when she returned to RN control and was paid off into Reserve. Fifteen months later she was transferred again, this time to the Brazilian Navy, and was renamed MINAS GERAIS: here she served until 2001 when she was de-commissioned before being towed to Alang in India where she arrived in April 2004. It had been 60 years since her launch!